The Art Institute of Chicago invites everyone to get into the spirit of the Christmas season as the museum welcomes visitors of all ages to see the Thorne Miniature Rooms decked out for the holidays. The beloved Christmas decorating tradition is back—and more festive than ever. The Thorne Rooms have entranced generations of visitors to the Art Institute of Chicago. These sixty-eight elaborately decorated miniature rooms give one a glimpse inside European and American interiors ranging from the late 13th century to the 1930s. 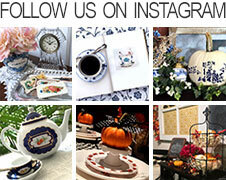 The rooms were painstakingly constructed on a scale of one-inch to one-foot. Envisioned by Mrs. James Ward Thorne and constructed by master craftsmen, the Thorne Rooms were completed between 1932 and 1940. A native of Vincennes, Ind., she was born Narcissa Hoffman Niblack in 1882 and at age 19 married the son of the co-founder of Montgomery Ward & Co. Although the Thorne's lived in Lake Forest, she also kept an apartment/studio on Oak Street in Chicago, where she would craft miniature rooms herself. Some were displayed at the Century of Progress in 1933-34, later making a world tour. 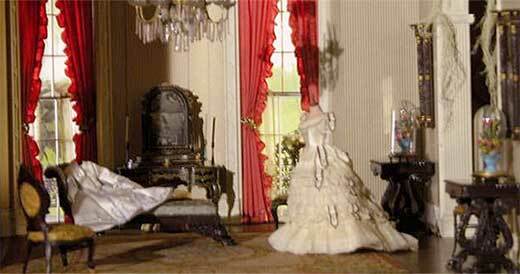 Many of her miniature rooms wound up in private collections. The rooms were installed at The Art Institute in 1954 after being donated to the museum by Mrs. Thorne in 1941. This year the museum continues their Christmas decorating tradition —and more festive than ever—with the addition of the traditional Chinese interior set to ring in the Chinese New Year! Plus, a new long-term loan, a miniature replica of a Pullman Observation Car that was exhibited at the 1893 World's Columbian Exposition in Chicago, is unveiled for the first time. 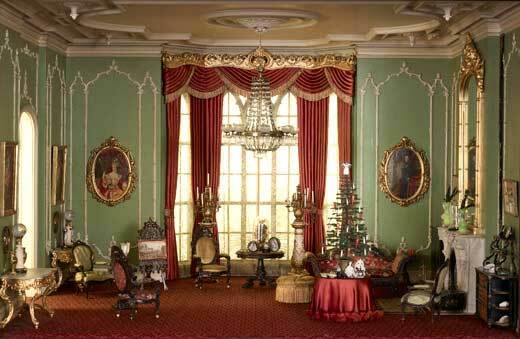 The Thorne Miniature Rooms are decorated with period-appropriate Christmas trimmings. Keeping to Mrs. Thorne’s exacting standards of craftsmanship, several renowned artists from across the country and around the world were engaged to create pieces for the rooms. Tiny toys from Germany, diminutive delicacies from Italy, and petite plants from South Africa have been added to the rooms. 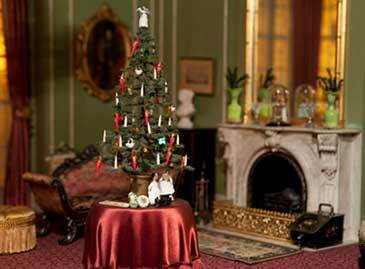 Among the most elaborate of the decorated rooms is the “English Drawing Room of the Victorian Period”, the only room with a Christmas tree, representing a Victorian Christmas. Now an ever-present feature of the season, the Christmas tree was brought to England from Germany in 1840 with the marriage of Prince Albert to Queen Victoria. The English Great Hall of the Tudor Period with a wassailing bowl, yule log, and an essential part of the costuming for that period’s singing and dancing revelers—a mummer’s mask. The Virginia Entrance Hall with Christmas mistletoe, wreath, and garland. The French Provincial Bedroom with shoes, or sabots, lined up before the fireplace, a crèche, and puzzle. The modern-era California Hallway with an Otto Natzler mid-century menorah and box with a dreidel. The New Orleans, New Mexico, and the Pennsylvania Dutch (German) rooms filled with regional Christmas treats of the season. The 1930s French Library joins with a tiny taste of Art Deco holiday glamour. Combined with a full roster of festive performances, enlightening gallery tours, and engaging activities for children, the Art Institute of Chicago is the holiday destination for the entire family. For general museum information visit online at www.artic.edu.